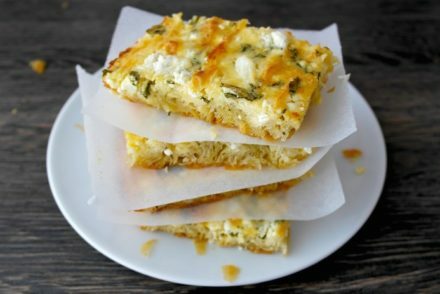 Spinach and feta is such a flavorful combination and a common Greek food pairing. The most popular place we see it is in spanakopita, the popular Greek spinach pie where melted feta cheese mingles with spinach and greens wrapped up in crunchy phyllo. But if making spanakopita is not something you are up to right now, a spinach and feta salad is just as delicious- with the right ingredients! I like my salads hearty and filling, I rarely have side salads, when I have salads they are usually as a main course, and this one is no exception. Plenty of spinach and beans with tangy feta, sundried tomatoes and an olive oil-balsamic vinegar-honey dressing that brings everything together. I accompany it with 1-2 barley rusks and it is complete meal. For this particular salad, I also added a bunch of fresh mint, it really gives a burst of “coolness” to this spinach salad and mint is very often combined with feta cheese in the Greek kitchen. 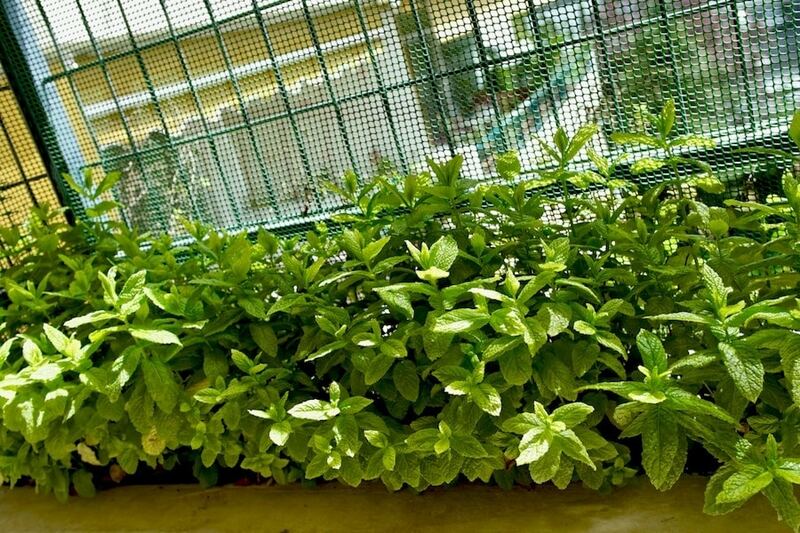 Luckily, I have a bunch of mint growing on my balcony so I use it any time I can. For the beans, I used Greek medium white dry beans, soaked them overnight and boiled them for 30 minutes . They were quick and easy to cook, but you can also use plain canned white beans. For the cheese ideally, you want Greek feta cheese. I would like to mention that saying “Greek” feta is redundant, as feta is a Greek product and in Europe only Greek feta can be called feta. 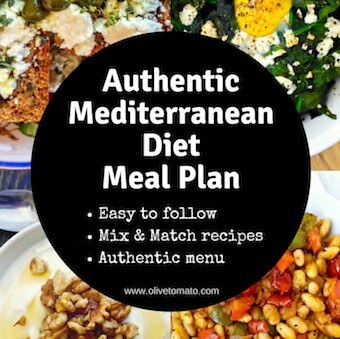 In any case, if you are unable to find Greek feta, at the very least buy feta that is made with sheep’s milk not cow’s milk -and if you want more tips on how to choose good feta click here. So you are getting a bunch of nutrients with this easy to make salad. Spinach obviously is rich in antioxidants, vitamins and minerals. The addition of olive oil provides flavor and helps with the absorption of the fat soluble vitamins. 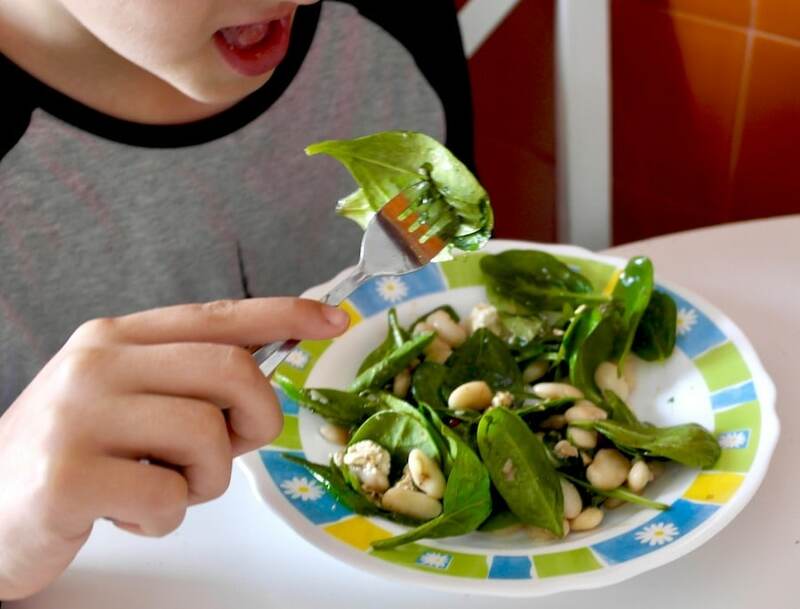 The beans and feta provide a good dose of protein with the beans also increasing the fiber in this salad, all of which promote a feeling of fullness and satiety. 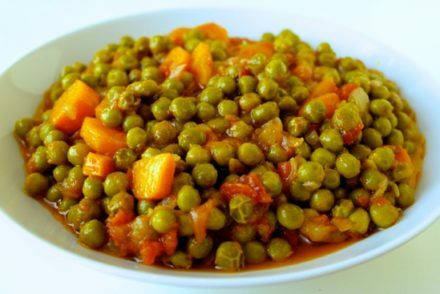 Most of the ingredients here are a source of antioxidants, so not only filling but also healthy and protective. Green leafy salads are usually intended for adults. But, with right ingredients and presenatation, kids will eat them and even ask for more. In a typical leafy salad for the kids I’ll usually add corn and some sort of cheese and an olive oil oil vinaigrette that will either have a touch of honey or raspberry jam. I think the dressing makes all the difference and the kids end up eating a couple of bowls of salad. 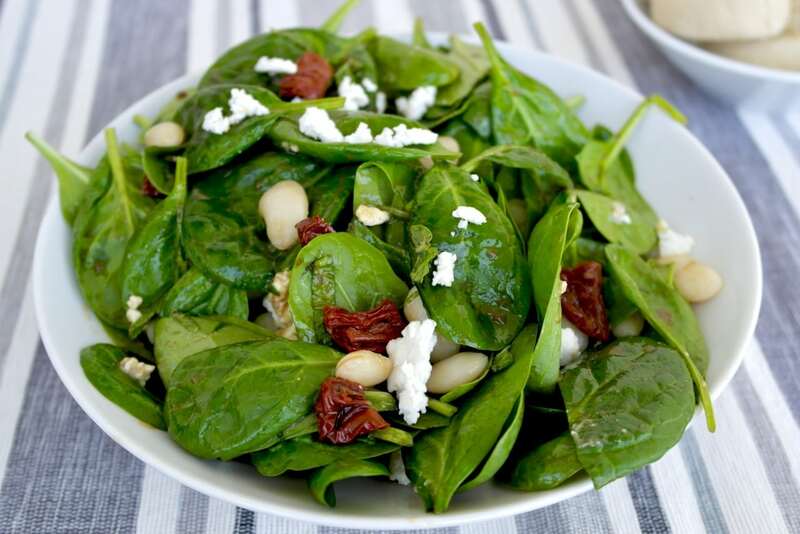 Hearty spinach and feta salad with Mediterranean flavors that will please everyone. If using dry beans: soak beans overnight and the next day rinse the beans and boil in plenty of water with a whole onion and a bay leaf for about 30 minutes until soft but not mushy. After boiling rinse in cold water and set aside. Prepare the dressing: In a small bowl mix with a fork the balsamic vinegar, honey, mustard and olive oil. Add pepper and salt to taste. 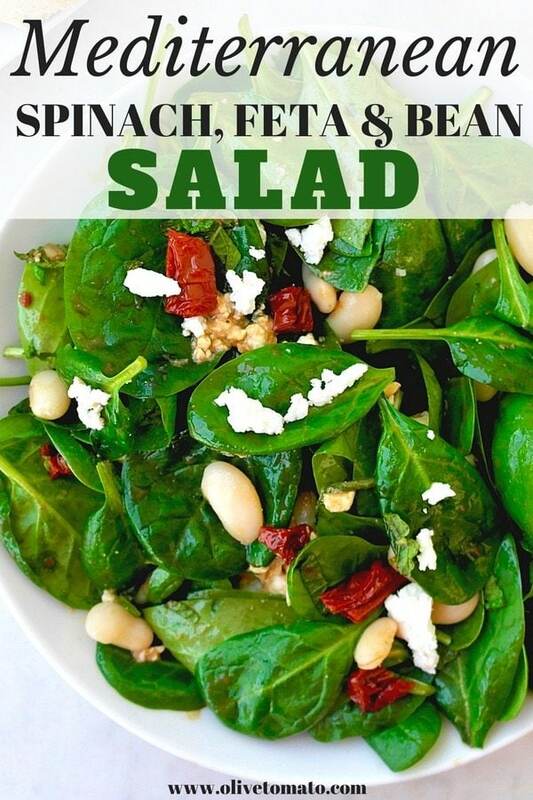 In a large bowl toss the spinach, mint and sundried tomato, add the beans and mix and sprinkle on top the feta. Add the dressing right before serving. 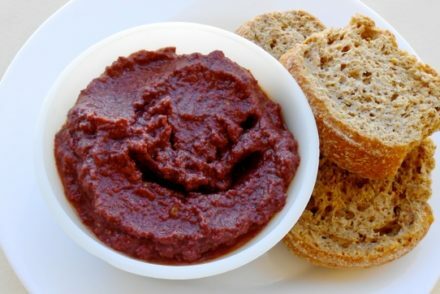 Serve with whole grain bread, breadsticks or rusks. I like the idea of using raspberry jam in salad dressing, thanks for the tip. My Greek Cypriot relatives would never make a honey and mustard salad dressing though, haha, but it’s so tasty. It’s a shame feta isn’t always what it’s purported to be- the same thing is happening now with halloumi cheese in the UK. Thanks Eva! Halloumi should be protected and gain PDO status. I like your idea. Thanks for sharing. I’ll try this. This is a really good salad dressing on any green salad. Just made it tonight on plain field greens and it was scrumptious, but then again I love vinegar. I’ve really been enjoying this site since I’ve been trying to eat less processed foods.